BMPs in stormwater pollution prevention are all designed for specific applications, each with strengths and weaknesses. DuraWattle has many strengths and can be a great innovative solution. To better understand its possible benefits, it’s helpful to see it in context with other traditional stormwater BMPs. How does it filter? The outer layer of fabric filters the sediment-laden water as it passes through the base of the wattle above the “tail section”. Clean flow-through rate of approx. 100gpm/ft^2. It does not filter hydrocarbons or dissolved metals. The fabric ponds sediment-laden water causing sediment to be retained as it settles. Clean water flow-through rate of approx 1-13gpm/ft^2. It does not typically filter hydrocarbons or dissolved metals. When properly trenched and secured, a fiber roll will slow the velocity of sheet flow runoff, filtering sediment-laden water through the roll and ponding excess runoff behind the barrier allowing the sediment to settle. Clean water flow through rate of approx. 7-8gpm/ft^2. It does not typically filter hydrocarbons or dissolved metals. A compost filter sock will dewater sites while retaining sediment, absorbing pollutants, and ponding excess runoff allowing additional sediment to settle. Clean water flow through rate of approx. 4.5-35 gpm/ft^2. Compost filter socks may be designed to absorb hydrocarbons or dissolved metals. What applications is it designed for? Perimeter control, stockpile management, drain inlet protection, and site access points. It is most effective when installed where heavy concentrated flow is expected and dewatering is a priority. Stockpile management and Perimeter control. It is most effective when installed at the toe of slopes where heavy sheet flow is expected. Perimeter control, check dam, drain inlet protection or erosion control. Most effective when installed on slopes perpendicular to sheet flow to pond water and prevent erosion. Stockpile management, perimeter control, or drain inlet protection. Most effective when installed downslope perpendicular to sheet flow or low concentrated flow. trenched six inches, nailed every foot, and backfilled. Hard surface applications: tail section is folded over itself, piece of cold rolled steel is placed ontop of folded tail section, and concrete fasteners are used to secure the product to the surface Trenched into the soil using either static slicing or traditional trenching, surrounding backfill is compacted, wood or steel support posts are driven 2ft into the soil, and filter fabric is secured to support posts (wire backing is optionally attached). 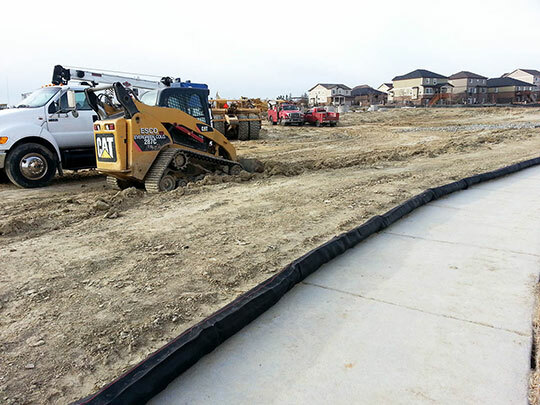 Before installation, slopes must be prepared by smoothing any gullies. The wattle is trenched into the soil, excess soil is backfilled behind the upstream side of the wattle, pilot holes are driven into the wattle using a steel bar, and stakes are driven every 3-4ft. The compost sock is set in place and then filled using a mechanical compost spreader. Stakes are driven into the sock every 10ft for sheet flow and every 5ft for concentrated flow. Edges of the socks should be turned upslope to prevent failure. Typically a compost sock is left onsite to help stabilize and promote vegetation. If properly weighted, a compost filter sock can be used on hard surfaces with concrete blocks or gravel bags behind the sock to help stabilize during rain events. Bugg, R.A.; Donald, W.; Zech, W.; Perez, M. Performance Evaluations of Three Silt Fence Practices Using a Full-Scale Testing Apparatus. Water 2017, 9, 502. How much will DuraWattle cost?